China's fiber adoption constituted 80% of global FTTH growth in the past 12 months, according to the latest report from Point Topic. The country has reported a 26 percent annual growth in FTTH connections. The report also highlights the decline of copper connections which dropped by 7 percent in the last year while FTTH/B/C connections increased by 28 percent in the same period. "Around 78% of global fixed broadband subscriptions are fiber (FTTH/B/C) and cable-based." 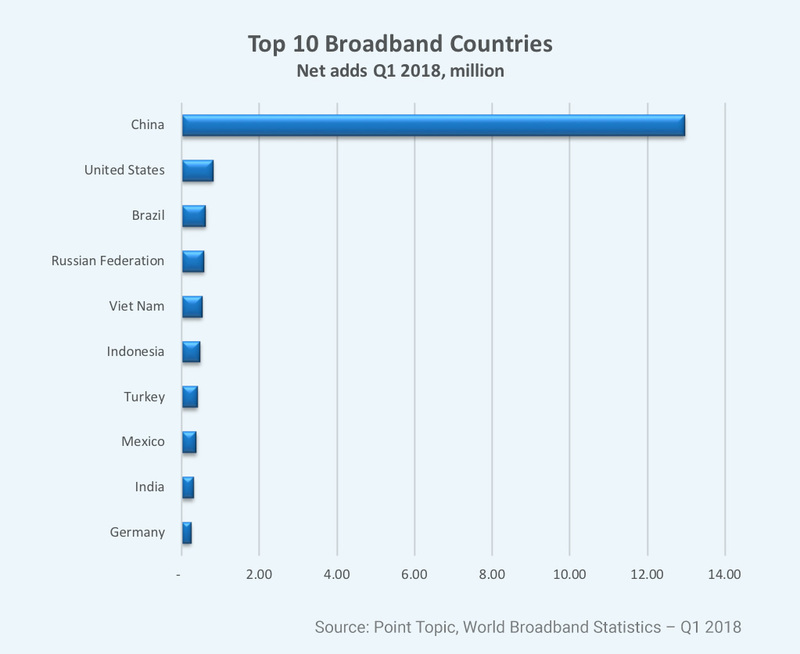 Brazil, Italy, France and New Zealand are among other nations that saw FTTH quarterly growth rates in double digits. Point Topic has also pointed out that high fiber broadband penetration does not necessarily mean equally competitive pricing. "For example, the median residential fiber broadband tariff in China is almost twice as high as in Japan, with similar fiber penetration levels and direct fiber (FTTH/B) dominating in both countries."